The two EU capitals Vienna and Bratislava are approaching each other. After a construction period of about two years, representatives of Austrian Federal Railways (ÖBB), the EU, the City of Vienna and the Province of Lower Austria opened the first part, the so-called "Vienna section" of the Vienna - Bratislava line extension. The completion of the second part, the so-called "Lower Austrian Section", will last until 2023. The journey time from the main railway station in Vienna (Hauptbahnhof-Wien) to the main railway station in Bratislava (Bratislava hlavná stanica) will be reduced from 66 minutes to 40 minutes. 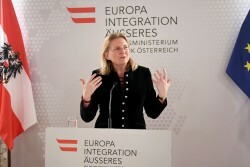 The Austrian Foreign Ministry presented the Intercultural Achievement Award (IAA) for the fifth time. The award honours inspiring projects in civil society that foster intercultural dialogue and coexistence. This time the award for sustainability went to a project from Mozambique. Ambassador Jörg Wojahn, the Representation of the European Commission in Vienna, and Secretary General of the OSCE Thomas Greminger used the dialogue-based work of their own institutions as a starting point and awarded prizes to projects from Ukraine and Tunisia. On Europe Day, one pupil from each member state of the European Union came to the Hofburg for a discussion. More political education in schools and a more comprehensive climate policy are their main demands. "We are 20 percent of the population, but 100 percent of the future."